Today is the anniversary of the first time a riverboat hit the railroad bridge between Davenport and Rock Island, Illinois. Why is this more significant than any other Mississippi River disaster, or any other time (and there were several) when a boat hit that bridge? Well, it’s all about the bridge–and the blame. The bridge in question was the first railroad bridge across the Mississippi. * It was proposed in 1842 and completed after 14 years of protests from steamboat owners and operators, who had benefitted from the natural railroad track blockade provided by the river. Despite their efforts, the bridge opened in April of 1856. Just two weeks later, the Effie Afton hit a pier of the bridge, which burned along with the hapless boat. The feud between the railroaders and the riverfolk likewise exploded. The company that owned the Effie Afton blamed the bridge for obstructing the river, while the railroads blamed the riverboat’s pilot. The former promptly sued the latter in “Hurd et al. vs. the Railroad Bridge Company,” which was tried in Illinois. A young lawyer from Springfield, one Abraham Lincoln, was hired by the railroad companies. The case went all the way to the Supreme Court. In 1862, the court held that as the bridge was built for the public good and was well-placed with enough space for navigation, it was not an obstruction. This decision allowed many bridges to be built across the Mississippi, without fear of lawsuits. This victory excepted, the first bridge suffered from terrible luck. A few years after the Effie Afton disaster, a too-heavy cattle car passed over the tracks and damaged the bridge. The construction was judged too light for the traffic by 1862 and was replaced with stronger materials along the same piers. In 1868, ice knocked a support out of alignment, allowing the wind to shove the swing span into the water. 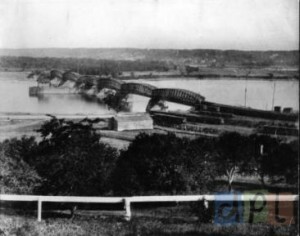 And by 1872, the wooden bridge was taken down altogether, replaced by the steel railroad bridge from Davenport , Iowa, to what is now called Arsenal Island. Throughout the 16 years of the bridge’s eventful career, riverboats continued to bounce off the piers with remarkable regularity, as if in memorial to the first boat lost to the bridge. But the Effie Afton herself wasn’t finished, yet. According to the Davenport Democrat (25Dec1940, p.16), one spring in the late 1890s saw an ice blockage on the Mississippi that wouldn’t budge, a thick sheet almost a mile square, reaching almost all the way across the river, and along from the railroad bridge to the other end of Rock Island. No one knew what had snagged the ice, but it was ruining barge traffic and keeping the ferry docked. So Captain Walter Blair took the J.W. Robinson, an old ferryboat with strap-iron on her bow, and rammed the ice a few times. The mass began to move, and was cleared out in an hour. Later, they searched for the obstruction that had held up the floe–and found the remains of the Effie Afton. *According to our information, the very first bridge of any type across the Mississippi River was built in Minneapolis, Minnesota in 1855, beating our bridge by one year. But we don’t like to talk about it. This entry was posted in Local History and tagged Abraham Lincoln, Accidents, Bridge, Effie Afton, Fire, Mississippi River, riverboats, Train. Bookmark the permalink. Benjamin Franklin Leete (1831-1927) built the Rock Island bridge as a Civil Engineer with the first Erie RR in New York. I think it was the FIRST RAILROAD bridge. The very first bridge across the Mississippi was probably a small footbridge near its source at Lake Itasca!! But who, in 1856, was Effie Afton after whom the steamer was named? You are correct: our bridge was the first railroad bridge across the Mississippi, but the Minnesota pedestrian bridge (according to our histories) was the very first documented bridge of any type. According to Hell Gate of the Mississippi: The Effie Afton Trial and Abraham Lincoln’s Role in it (Riney, 2006), The doomed steamboat was named after the pseudonym of Sarah E. Monmouth, a popular author of the time. Effie Afton’s Eventide: a Series of Tales and Poems was written in 1854. In my childhood home we had old oil wooden bricks laid across our garage as a floor, we were told from an elderly neighbor that those came from the bridge that Lincoln crossed and burned which is this bridge. Our house was the 1st house built in the Shaw addition by the trail to Fort McCellan. I wish i had one of those bricks now. The Rock Island Bridge case was a very dramatic event in local and national history and is one of those dramatic events that took place in the years before the Civil War that have often been forgotten. The case demonstrates that the tensions between the North and South were not as simple as slavery and free-labor. Issues of development and change were also at play. For example, Jefferson Davis as Secretary of War under President Pierce attempted to block the construction of the bridge because he favored a southern route for the transcontinental railroad. Bad Behavior has blocked 857 access attempts in the last 7 days.